CUSTOMERS ARE LOOKING FOR YOUR PRODUCT OR SERVICE RIGHT NOW. CAN THEY FIND YOU? Customers are looking for you right now. Can they find you? Schema Markup, Rich Snippets, & Knowledge Graph upgrades. Secure your website with an SSL Certificate, security & firewall software. Does your site work on mobile and optimized for mobile. Upgrade your website optimization, website speed, images, videos & content. Personalized one on one client support. “I was starting a new business and it was my first website. Main Street SEO helped me launch my locksmith business with a New Starter Site, which included” ~ read more by visiting our portfolio page! Main Street SEO – We Drive Traffic! 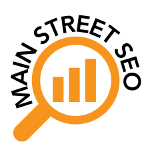 Main Street SEO specializes in Local Google rankings using Local Organic SEO, while also utilizing On-Page SEO or Organic SEO. Local SEO together with content development, Social Media, local directories, Blogging, maps, and Google Analytics. We will design a Digital Marketing blueprint and Local SEO strategy targeting the specific search terms that your customers are using to try to find you. We offer Local SEO Services in Connecticut with the goal of using Local SEO techniques to make your website visible and receive increased web traffic and new visitors from your local market via search engines like Google, Yahoo, and Bing. The Local SEO CT process is quite lengthy and requires time and experience. At Main Street SEO CT we get potential clients that use search engines like Google to find your blog or website directly on the first page of the search results page for Connecticut SEO search results. SEO CT gives Google, Yahoo and Bing good reasons for their search engines why they should give you the best places in the search results for your blog or website and to show up on the 1st page of search results.